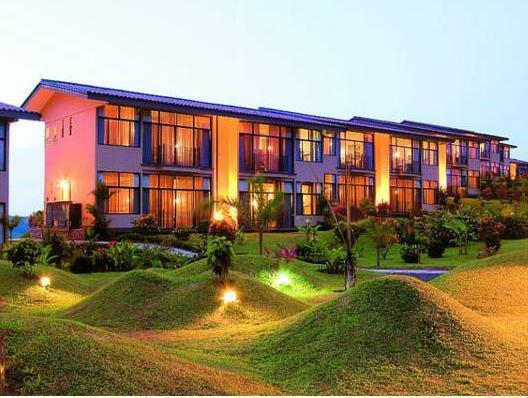 ﻿ Best Price on Hotel Arenal Kioro Suites & Spa in La Fortuna + Reviews! Featuring an on-site hot spring bath, a swimming pool, stunning Arenal Volcano views and free Wi-Fi throughout, the Hotel Arenal Kioro Suites & Spa is 10 minutes from the Arenal Lake. The suites feature rustic décor, a hot tub, air conditioning, flat-screen cable TV and a balcony with Arenal Volcano views. The bathrooms have a shower and free toiletries. Guests at Hotel Arenal Kioro Suites & Spa can enjoy international cuisine served at the 2 on-site restaurants. Room service and a bar are also available. Activities such as hiking to the Arenal Volcano, horseback riding and rafting at the Sarapiqui River can be arranged, and spa treatments are offered. The game room features a ping-pong and there is a business center and a gym, as well. This hotel is 7 miles from La Fortuna Town Centre and 2 hours and 30 minutes from the Juan Santamaría International Airport. Please note, that for the reservations that stays on the Property during the night of December 31st 2017, will be an extra charge for a mandatory dinner of $80 USD per person. Cannot beat the views - each room, situated at the base of the volcano offers stunning views. Rooms were much larger than appears in photos. Amazing service from staff - have never been treated so nicely and professionally. Very secure - gated security at entrance. Close to major attractions. Included buffet breakfast of tasty meats, egg station, fruits, along with lovely local cuisine. Though higher price point, you get what you pay for - perfect for a special splurge.